Apply for PPO Jobs | Pakistan Post Office Jobs 2017 Application Form Download | www.pakpost.gov.pk. PPO Pakistan Post Office Department-Pakistan Postal Department is one of the reputed Federal Government Department working all over Pakistan and it announces job opportunities once in a year and currently it has announced vacancies for different offices located in Islamabad, Lahore, Karachi, Peshawar, Quetta, Hyderabad, Rawalpindi, Multan and the vacant positions are (Driver, Duplicating (Gestetner) Machine Operators, Naib Qasid, Security Guard, Sanitary Worker, Assistant Delivery Agent, Mail Peon, Porter, Runner, Carpenter, Runner, Stamp Vander, Attendant, Sanitary Worker, Packer, Coolie, Orderly Peon, Plumber, Mail Runner). Female Candidates may apply for the post of Naib Qasid, Sanitary Worker, Farash, Sweeper and Stamp Vendor. Candidates civilians, having valid domicile of a relevant area are eligible to apply but they have to compare themselves with the requirements mentioned in the following image where qualifications from Matric to Middle with relevant diplomas and experience having candidates are welcome to apply. So, those who wanted to apply now as a fresh candidate need to apply as per the following how to apply procedure given below. Application Form to apply can be downloaded from www.pakpost.gov.pk or from www.JobsAlert.pk. Duly filled application along with attested copies of educational certificates, CNIC, domicile and recent photographs should reach the relevant office for which applying. Candidates have to attach with the application a paid Postal Order of Rs. 300/- in favor of Pakistan Post Office. Incomplete applications or received after due date shall not be entertained. The last date for submission of application is November 24, 2017. Last Date to Apply: November 24, 2017. Address: Relevant Office Address can be examined from the following Job Advertisement. 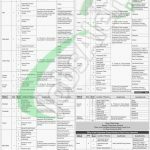 Get Pakistan Post Office Jobs 2017 Application Form Download | www.pakpost.gov.pk newly announced jobs equal to BPS-01 to BPS-05 and all those who are just Matric/Middle pass are allowed to apply as soon as possible on a prescribed application form and make your future bright.